It’s rare that I come across a mystery novel where I feel more engrossed by the lives of the living characters than I do the circumstances surrounding the dead characters. Usually, I’m flipping pages as quickly as I can read them to race to the end to find out if I’m right about who did it and why. 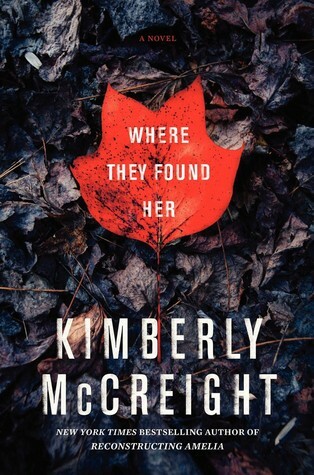 Recently, I read a different kind of mystery, one that I read so slowly in order to fully absorb the complicated lives of all the many characters: Where They Found Her by Kimberly McCreight. Now, there definitely is some tough subject matter in this book. The overall premise is that the dead body of a baby is found in a small college town, and as the facts about what happened come to light, a whole lot of other secrets come to the surface. This book is told from several different perspectives, which I think has become quite the trend in fiction. It really worked in this novel, and the multiple narrators helped me to really get to know and understand where the characters who coming from. If I had to pick a main character, I would probably pick Molly – a young mom and journalist who recently suffered a miscarriage. Throughout this book, Molly’s sections explore motherhood and the many ways that guilt can arise for mothers. I found her to be flawed in a great, believable way. She seemed like a real person suffering from grief and loss and trying to figure out how to survive and move on. She doesn’t always make the right choices, but she is very endearing and she learns a lot about the world and herself throughout the novel. One of my other favorite perspectives was Barbara. I felt like I learned so much about her as the book progressed. She might have been one of the least likable characters, especially at first, but I felt like I really understood her by the end. That’s not to say that she transformed into a more likable character. Rather, I understood why she did the things that made her seemed unlikable, and that enabled me to have more compassion for her and real people that I know who are kind of like her. It’s easy to judge people who come across as very intense and controlling, but this behavior often stems from deep insecurities or learned patterns of behavior from parents or other figures present in childhood. I love thrillers where the characters are so richly developed. Did you read I Let You Go? I loved the characters in that novel as well. No, I haven’t read that one yet. I’ll have to add it to my list!